Country calling codes are prefix codes and can be organized as a tree. In each row of the table, the country codes given in the left-most column share the same first digit; then subsequent columns give the second digit in ascending order. Originally, larger countries such as Spain, the United Kingdom and France, were assigned two-digit codes to compensate for their usually longer domestic numbers. Small countries, such as Iceland, were assigned three-digit codes. Since the 1980s, all new assignments have been three-digit regardless of countries’ populations. +379 – Vatican City assigned but uses Italian +39 06698. ^ a b c d e f g h i j k l m n o p q r s t u v w x y z aa This country or territory is part of the North American Numbering Plan (NANP), even though it may be geographically far from North America (Mexico is not included). 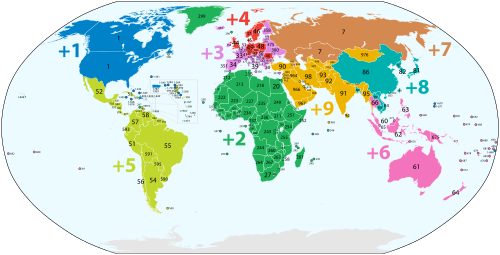 The country code for all NANP countries is 1; the numbers that follow are used in the same way as area codes are in the U.S. and Canada. ^ a b Russia, Kazakhstan, and Abkhazia make up the Seventh World Numbering Zone. From August 2007, Kazakhstan changed all area codes to start with 7; however, 6 is also reserved for Kazakhstan. Digits 3, 4, and 5 are reserved for Russia. Abkhazia was assigned +7 840 for landline and +7 940 for mobile operators on 28 September 2009. Abkhazia will also continue using +995 44. Other digits are reserved for Russia. Currently, there are no internationally accessible numbers starting with 0, 1, 2 or 5 – these are access codes and similar arrangements. ^ Hoefer, Hans Johannes (1978). Malasia. APA Productions. OCLC 651760990. ^ a b c d International Telecommunication Union (2011-11-01). "List of ITU-T Recommendation E.164 assigned country codes" (PDF). Archived (PDF) from the original on 2012-01-31. ^ "European Telephony Numbering Space (ETNS)". European Radiocommunications Office. 2009-05-28. Archived from the original on 2011-06-09. ^ a b "SCO Dialing Codes". Special Communications Organization. ^ "Abkhazia remains available by Georgian phone codes". Today.Az. 2010-01-06. Archived from the original on 2012-07-12. ^ GNCC (2010-03-30). "GNCC Communication of 30.III.2010" (PDF). ITU Operational Bulletin. ITU-T. Archived (PDF) from the original on 2013-07-20. See page 12. Wikivoyage has a travel guide for Country calling codes. "List of ITU-T Recommendation E.164 Dialling Procedures as of 15 December 2011" (PDF). ITU. International Telecommunications Union (15 December 2016). "Complement to Recommendation ITU-T E.164 (11/2010) - List of Recommendation ITU-T E.164 Assigned Country Codes (Position on 15 December 2016)" (PDF). ITU Operational Bulletin. Geneva (1114): Annex. ISSN 1564-5223. Retrieved 19 December 2016. "Telephone and Internet Country Codes in 10 Languages". LincMad. "World Telephone Numbering Guide". World Telephone Number Guide. "Phone calling codes of all countries with ISO3 and flags + phone codes of cities by countries".